Have you been looking for the perfect jacket or hoodie to crochet? Now you can crochet the popular Paige Hoodie, as featured on the front cover of Interweave Crochet Winter 2015 with the Paige Crochet Hoodie Kit! Have you been looking for the perfect jacket or hoodie to crochet? Look no further! Now you can crochet the popular Paige Hoodie, as featured on the front cover of Interweave Crochet Winter 2015. The Paige Crochet Hoodie Kit is a great kit for any crocheter looking to challenge themselves with a more complex project to crochet. This relaxed-fit, three-color hoodie features cool textures and includes instructions for altering for a plus size fit. Order your kit today! 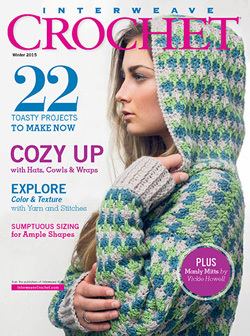 Interweave Crochet Winter 2015 features 22 toasty projects to crochet! Explore crochet texture and colorwork in 10 garments, including two sweaters for children and one for a guy. We have six plus-size sweaters and guidelines for adapting sweaters to a plus-size. Plus you'll find 10 accessories, including hats, cowls, and shawls. Also included in this issue are the instructions for the Paige Hoodie, featured on the cover. This relaxed-fit, three-color hoodie will become your go-to layer! Its generous length and inner zipper placket will keep you plenty warm. Wear the roomy hood down as a wide collar, or up over the head and pinned closed with a shawl pin. The finished size of this hoodie measures 39 (43, 47, 50, 54, 58)" bust circumference and 29¼ (29¼, 30½, 30½, 31¾, 32¾)" length. Yarn included in this kit is enough to crochet a size 54" bust hoodie. Garment shown here measures 39" modeled with 6" ease. 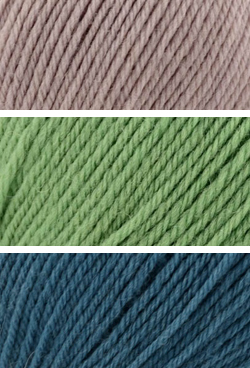 Universal Yarn’s Deluxe DK Superwash is 100% wool and is 284 yd [260 m]/3½ oz [100g] per ball. Yarn included in this kit is enough to crochet a size 54" bust hoodie. Order the Paige Crochet Hoodie Kit today!